Spring is time for renewal and rejuvenation! 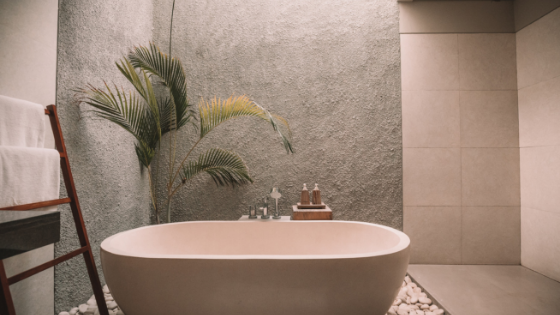 With a few simple ideas, you can turn your Atlanta apartment bathroom into a private spa. Spas do a great job setting that relaxing tone right when you first walk in the lobby. Capturing this in your home is all in the details. Find a painting or photograph that soothes, like a sunset on a beach or a gorgeous flower, and hang it or prop it up in your bathroom. Add your own style by purchasing color-coordinated towels in cooler tones, like blues or purples. Get a deliciously-smelling candle or a Himalayan salt candle holder and fresh flowers to unwind your senses. Also remember that a tidy and clean bathroom can make a world of difference, too! The one thing that makes the spa so wonderful is the products. They smell fabulous and feel incredible. Invest in you through quality body scrubs, face masks, face scrubs, bath bombs, shower bombs (for those of you who prefer the shower experience), or lotions. You'll need these things to incite your olfactory experience as much as your touch and sight experiences. Once you have your bathroom decorated and your products in place, get ready to indulge yourself. Light those candles, open those bath bombs and breathe in the luxurious aromatherapy. If taking a bath, maybe add a special effect by sprinkling flower petals on the surface of the water. Put on a face mask and sit in the warm tub with eyes closed. Then maybe take a shower with a shower bomb (by placing the shower bomb on the floor of the shower or in a mesh bag attached to the shower head) and rinse off. Be sure to have a soft robe to use after the bath. You'll want to lather on the lotion and settle down on your bed with a good book and a warm cup of tea. With your senses pleased, you can refresh your mind, body, and soul. Contact us about our apartment home in Atlanta today!